Elegant. Forgiving. Effective. There are a lot of words used to describe the jane iredale line, but the best form of communication is the visibly improved skin of the men and women who use the products. Praised by plastic surgeons, dermatologists and skin care professionals worldwide, jane iredale was the first to supply the aesthetics industry with a full line of mineral-based makeup that was good for the skin and the environment. A low-maintenance solution for high-maintenance complexions, jane iredale mineral foundations pack in the protection of a foundation, concealer, powder and sunscreen into each product, with a palette that celebrates skin of every color and state. jane iredale products are tested and formulated without FD&C dyes, chemical preservatives, irritants such as bismuth oxy-chloride, and skin-drying fillers, like talc. Lightweight and water-resistant, jane iredale mineral makeup offers unsurpassed UVA and UVB protection, while proactive botanicals and algae extracts defend skin from harmful free radicals, airborne pollutants, dehydration and the stresses of everyday life. 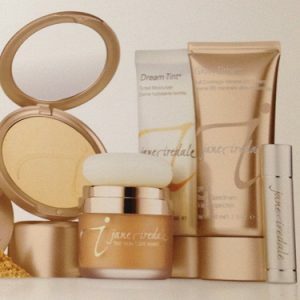 Jane Iredale’s NEW Starter Kit is here! Feel totally confident in effortless makeup that actually improves the condition of your skin. The NEW Starter Kit introduces you to the foundation of the jane iredale line. You’ll be amazed by how beautiful your skin can be. Smooth Affair is a luminizing primer that nourishes and prepares your skin; it brightens and moisturizes while makeup goes on more easily and lasts longer. Multi-tasking Amazing Base and PurePressed Base, which have earned the The Skin Cancer Foundation’s Seal of Recommendation, each provide four important functions in one: foundation, concealer, sunscreen and active skin care benefits. To order any of these products or for prices and additional information regarding a particular product, please call Fonda Jo at 916-967-6266. Copyright © 2004 – 2010 by Iredale Mineral Cosmetics, Ltd.